PRISMA (Precursore Iperspettrale della Missione Applicativa) is an Earth observation system by the Italian Space Agency (ASI) with innovative electro-optical instrumentation which combines a hyperspectral sensor with a panchromatic, medium-resolution camera. It is a follow-on project for the cancelled HypSEO mission. The advantages of this combination are that in addition to the classical capability of observation based on the recognition of the geometrical characteristics of the scene, there is the one offered by hyperspectral sensors which can determine the chemical-physical composition of objects present on the scene. This offers the scientific community and users many applications in the field of environmental monitoring, resource management, crop classification, pollution control, etc. Further applications are possible even in the field of National Security. The Hyperspectral / Panchromatic Payload is derived from HypSEO and updated as for the JHM Mission. It features a space resolution of 20-30 m (Hyperspectral) and 2.5-5 m (Panchromatic) with a swath width: 30-60 km. The sensor operates in the spectral range of 0.4 - 2.5 µmm (Hyp) or 0.4 - 0.7 µm (PAN) and provides continuous coverage of spectral ranges with 10 nm bands. 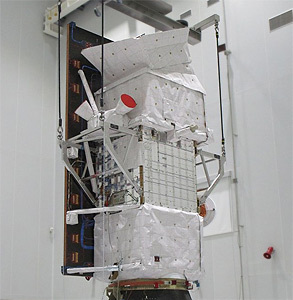 The PRISMA satellite is built on an evolution of the MITA bus by Carlo Gavazzi Space SpA. PRISMA is baselined for a Vega launch in 2013, but as back up it is also compatible with the PSLV, Dnepr or Rokot-KM launch vehicles.